For other places with the same name, see Addington. Addington is a village in the English county of Kent close to the M20 motorway between Wrotham Heath and West Malling. It was known as Eddintune in the Domesday Book. The meaning of Addington is Æddi's (or Eadda's) estate. Addington is notable for Addington long barrow and the Chestnuts long barrow, which are Neolithic chamber tombs in the village. The parish covers just under 700 acres (2.8 km2) in area with 291 houses. The Addington Brook runs through the parish. Addington can lay claim to be one of the few villages in the country with over 5,000 years of continuous habitation. Addington had two mills at the time of the Domesday survey. There was a watermill powered by the Addington Brook (TQ 656 587 51°18′12″N 0°22′36″E﻿ / ﻿51.303227°N 0.376605°E﻿ / 51.303227; 0.376605) which was demolished in the nineteenth century, the site now lies within West Malling Golf Course. The remains of the old Addington Place (now beneath golf course and stables) were visible up until a few years ago, and traces of the former gardens of Addington Park can still be seen. Rockeries, ponds and old tennis courts, are easily discernible in the private grounds of the Seekers Trust between the church and the golf course. It is rich in Neolithic archaeology, but much archaeological evidence has been lost to the mechanical digger. Some sites were excavated during the building of the motorway. The Chestnuts long barrow is the better preserved of the two. It was excavated in 1957 and artefacts from the dig are displayed in Maidstone Museum. It is believed to lie on a Ley line. Addington Long Barrow is not as well preserved, with much plunder of the area taking place over the centuries, and a road driven through it. There is one pub, The Angel. There are rumours of a tunnel from the basement to the church, 750 metres (820 yd) away. There is no school in the village, with children attending schools in nearby villages. Addington is partially divided by the M20 & M26 motorways and is scarred on both sides of the motorway with sandpits and quarries, now almost worked out. The village is home to a cricket club, Addington Village Cricket Club, which has two Saturday teams and a 1st XI in Division 2 of the Kent League (1st XI). The parish church is dedicated to St. Margaret. The Reverend Linda Shuker is the current incumbent. Addington is served by bus routes 58, 70 and 222. The nearest railway stations are Borough Green and West Malling, on the Maidstone East line. ^ "Civil Parish population 2011". Neighbourhood Statistics. Office for National Statistics. Retrieved 23 September 2016. ^ "Kent place names". BBC. Retrieved 2008-03-09. ^ a b "Village Information Sheet". Addington Parish Council. Archived from the original on 2011-09-03. Retrieved 2008-03-09. ^ Coles Finch, William (1933). Watermills & Windmills. London WC1: C W Daniel Company. ^ Fuller & Spain (1986). Watermills (Kent and the Borders of Sussex). Maidstone: Kent Archaeological Society. ISBN 0-906746-08-6. ^ "Watermills list". The Mills Archive. Archived from the original on 2010-04-18. Retrieved 2008-03-09. ^ "The Chestnuts". True North Enterprises. Archived from the original on 2009-10-25. Retrieved 2008-03-09. ^ "The Long Barrow". True North Enterprises. Archived from the original on 2009-10-25. Retrieved 2008-03-09. 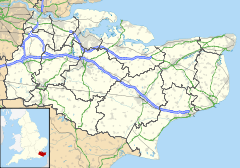 Wikimedia Commons has media related to Addington, Kent. This page was last edited on 13 March 2018, at 15:54 (UTC).